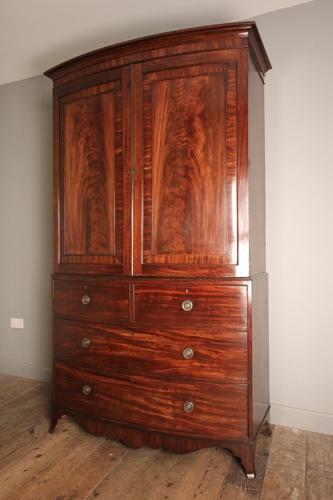 A stunning George IV Mahogany Linen Press with superb figured Mahogany and rich colour throughout. Having 2 double panelled doors with striking cross-banding and brass bead which open to reveal a hanging interior. Beneath is an arrangement of 4 Mahogany lined drawers with brass ring handles and original locks. The whole raised on splay feet with a shaped skirt. In wonderful condition throughout. English, Circa 1825.